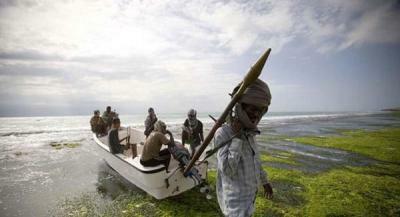 Somali pirate activity in the Indian Ocean has declined considerably. Yet in 2014 there was more than 25% rise in maritime piracy and armed robbery according to Maritime Risks Forecast. Somali pirates accounted for only 4% of global activity in 2014. Attacks by Nigerian groups in the Gulf of Guinea—another piracy hotspot in recent years—declined by 12%. Asia was the region with the most attacks on vessels in 2014 accounting for 30% of the global. Tom Patterson writing in Forbes magazine in February this year says that though criminal activity is a persistent risk, maritime operators will be more affected by broader political, operational and security risks. Geopolitical tensions and territorial disputes in Asia will shape the maritime security environment in Asia for the foreseeable future. Geopolitical uncertainty over Russian sanctions affects dry bulk container and tanker shipping. An increase in the number of migrants fleeing conflicts in North Africa and the Middle East will place further strain on Mediterranean shipping routes.